It’s been a minute since last I put on my writing hat while packed into a three-seater on NJ transit or huddled in a corner of Hoboken terminal. My work being heavily digital has gifted me some degree of carpal tunnel and sometimes the thought of clenching my phone a minute longer to write something is enough to deter me from the practice. But so much happens in these minutes, hours spent contained in a metal tube, devoid of service, surrounded by people and on occasion still feeling alone. Today marks one year for me as a commuter. I refer to other people as tourists whereas I myself was a tourist in this gigantic city system a year ago. I get lost far less often, I can transfer trains, I can help a straggler on the corner and I walk quickly enough to appear to an onlooker like I know where I am heading. While commuting isn’t as romantic as it had been the first spring months I began work, it still entrusts me with forced quality time with myself and for that I am always grateful. And yet every day, a new experience en route to and from my job, another anomaly of the train uncovered. I lost my mother-in-law at 6 pm on a work night a few weeks back. I had been planning to get drinks with friends and was plucked from this carefree space and transported to one of fear and sorrow. I deliriously trekked to the PATH and sobbed on the train, anchored against the window. I tilted towards the corner to hide my face from view but noone noticed me. Not one soul. I’m not sure if this is good or bad? Perhaps both. I recall in my writing from about three months ago that I felt as if I was losing my tenderness canvassing the city space. I’m more impatient than I once was. I have trouble unplugging as I feel a sense of urgency to be available. I rarely allot myself the time to be unproductive and feel endless yearning for a moment of calm all the while feeling excited and invigorated to have found work that is stimulating and exciting. When I hit the tunnel and service goes out I am outraged. I refresh the phone as if something will change and magically cell service will cut through water and concrete. Alas, I have to be comfortable sitting with myself and my thoughts for however long that spread of track is. Maybe connectivity is so desired because it prevents me from being in my brain all alone. My college roommate used to tell me that. Try not to reside alone in your head too too long. It can be a scary and vulnerable place. I still wonder what it would be like to be an adult without immediate access. What would I do on the train in lieu of checking emails or scrolling? Even my reading is interrupted by a buzz or a ring. When I have kids I want to teach them the power of boredom. The joy of being uninfluenced by the forces of popular culture that tell you what needs fixing or who you should aspire to. The allure of disconnecting and daydreaming, without an intended destination. I pray amidst the constant onslaught of information and pressure they will know snippets of a childhood like I had with rollerblades, scraped knees, and conversations happening face to face. I pray I myself get back to this place too. For now, setting my devices aside and gazing out the window at the same landscape will be my solace. The news is unsettling, rather heartbreaking. People are suffering as their homes are ravaged by Hurricane Harvey. Parents pray that their children can grow up in some semblance of peace. I asked my parents if it was like this when they were young. "Should I have kids? Is it going to be ok?" They say there were bullies as long as they can remember and their parents before them; they just dressed differently. People were aggressors since nearly the beginning of time. But still we hold on to the idea that we will someday live in a violence and bias free world. There are enough polarizing opinions out there. There is sufficient blame and shame being cast in different directions so I am going to find the common ground. I am confined to a metal tube each morning and each evening, Monday through Friday, and I am comforted by the state of affairs as I have experienced it on the train. When you have a television sized smart phone, you forfeit some level of privacy. Lock screens are available for passersby to see and sometimes admire. Lock, Unlock, Spotify, Instagram, Lock, Unlock, Fruit Ninja, Twitter, Lock Unlock, Skimm, Text, Lock. Every lock screen I have gazed at unintentionally features something beloved. A child, a partner, your favorite food. Predominately children, I have seen. People find comfort in children. When we clutch our devices day in and out, the first sight we need to see is something beloved. A mother putting suntan lotion on her babes is such a small act that solidifies the goodness in humanity. It conveys, I've birthed you and I will care for you, your scalp and the spots behind your ears. Predominately, seats are offered to the elderly, the disabled, and pregnant women. This is a tricky one, because some do not want to have a seat offered to them and some women may appear to be pregnant but are not. Nonetheless, the intention is universal to offer a seat to someone else whose labor might be lessened, even slightly, by a chance to rest their legs or feet. I've offered many seats, even just by scooting over in a three seater, to the undesirable middle spot, so that someone could have a seat. The people have mostly been appreciative. Whether or not we care to acknowledge it, we are all affected by implicit bias. There is no way around it. The noblest among us will claim not me. But we were programmed since the days of Sesame Street to identify that "one of these things is not like the other." We received shiny tickers on our worksheets for identifying what is different. We were shaped by culture, fear and imperfect teachings. To deny our own ignorance is more damaging than to embrace our fallacies as friends, and teach them well. To extend a hand to someone who doesn't look or believe as you do, to try and understand what made a person behave as they do, to attempt an open mind. I cannot change another person by shaming them, hurting them, or ignoring them. I can work on myself though. When the Path train comes to a sudden stop, we all sway in the direction that inertia carries us. Like a scene out of a musical I queue music by Pasek and Paul in my head comprised of the hum of the train, a syncopated rhythm, and crunch of metal. Heads bob. Music and travel combined make me feel like life is a film and this is the soundtrack. I am surely not alone in having the vivid experience of life slowing down when a song comes on that you love. A calm comes over you as you travel from point A to point B, the star in your own movie. 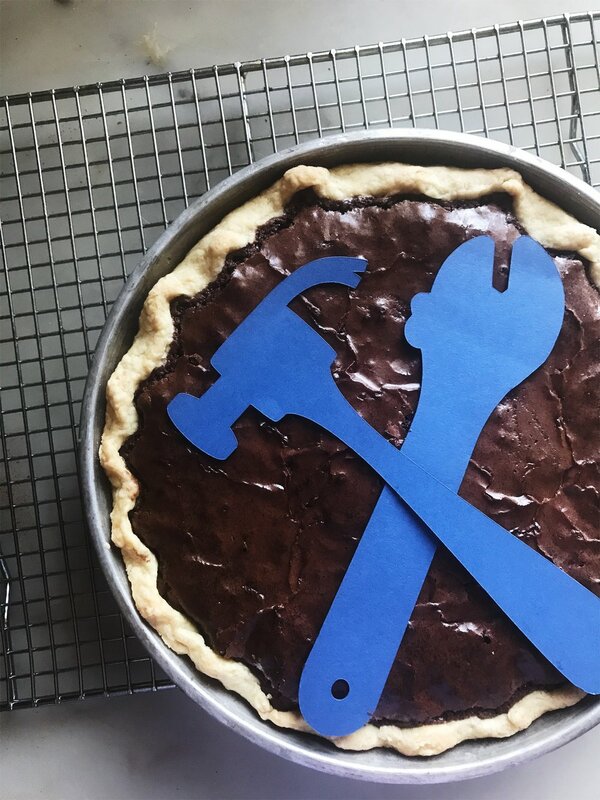 To assemble a brownie pie, line a 9 inch tin with your favorite crust. I use this one from Williams Sonoma. Fill with brownie batter and bake in a 350 degree pre-heated oven for 50 minutes. I used my Cricut Explore Air 2 to make Labor Day themed stencils. Top with powdered sugar, and serve. I felt something like shame ordering pepperoni pizza and fried calamari on the train. It was not the quiet car but I am always self conscious speaking on the phone when people can hear. I was hungry and did not want to wait, but was oddly nervous people would think ill of me ordering a whole pizza for two people. But how would they know? AND why should I care. A woman a few rows up grabbed her phone and dialed for Chinese. Solidarity, sister. Bros will be bros. I smirked because I was confined to the corner of the train in my spot where I lean between the door and the end of the seat, so I don't have to touch anything but I have something to balance against. Two guys forfeited confidentiality when they spoke loudly directly in to my ear budless ears. "My plan for the winter is to get fat," one said. "Well fatter I should say." Raucous laughter between them. "Social media is like the Tinder of advertising." I got a kick out of this one. Makes some sense. But he went on, "I will never use Tinder again." "Dude, you have been dating your ex's close friend for five months. Tinder would be your safest bet." I chuckled discreetly and the lady next to me had taken out her ear buds to enjoy the exchange. Worker bees funnel out of the train. Most of us have to work; it is not a choice but a certainty. We work morning, noon and night and still barely make the bills on time. If we are fortunate, we can choose to some degree how we labor. Are we making music, are we trading, are we erecting buildings, laying floors, counseling the addicted, healing the sick. On the porch in the Pocono mountains I was lamenting unnecessarily about student loans and feeling indebted, still, to a system. My Dad looked at me and said paying bills is a noble undertaking, if not a privilege. Yes, he made paying bills sound enviable. I will think twice before cursing my responsibilities. They represent opportunities, wonderful experiences of the past, and ideally security in the future. Sweater weather, pumpkin spice, and legs shaven less frequently is nearly upon us. I am surely not the only one looking forward to one or all of these fall themes. Another thing we might have in common. Men and women plunge in to violent waters to save stranded horses and dogs. Ladies rally to fix hair and build the spirits of others. Officers line the streets to protect people who distrust them. The men and women of the armed forces fight to ensure liberties, go fund me pages pop up to help a comrade in need. While we are infinitely fallible, there is good to be found and celebrated. The state of affairs is nowhere near perfect, but was it ever? Burrata from The Cheese Shoppe on LBI with Extra Virgin Olive Oil, tomatoes and chives. It's the first day back after the long Fourth of July holiday weekend. A commuter near me is particularly agitated and Shhhh-ing anyone who utters a peep in his "quiet" car. The door is jammed and rhythmically knocks; this happens when the train isn't level. My sunburn is itchy. I close my eyes. Waves are pounding against the shoreline. I am back on the beach alone with the rush of the wind and my thoughts. My college roommate's mother always said "never go into the deep confines of your mind alone, it's a dangerous place." I went there anyway. Other than the gulls, the waves, the wind, all the sounds God intended to bellow on into perpetuity uninterrupted, there is silence. The sound of silence. I am not accustomed to it, rather more familiar with noise. Taylor ham for this Jersey girl at Dockside Diner. I resort to talking in the moments I doubt myself. Discomfort creeps in and I feel an urgency to explain. When I am wronged, the first remedy is to utter the words: to my mom, my husband, the cats, even social media "friends" if very desperate. I try not to do this as I know everyone has their own set of complex issues and Facebook makes a poor therapist. As I sit, I'm reminded of my Nana's love of the sea. She used to walk the beach with her mom early morning until noon each day in the summer. I lay back on the cold sand and fog rushes over me like J.K. Rowling's dementors. I peer into the sky and pray for peace in my heart and in the hearts of the people I love. Anxieties try to challenge my serenity but I do not let them in. I am regenerated alone on the beach with no one around to judge or affirm. The sea reacquainted me with silence, the silence that the city took from me. The sea taught me to stop filling the space, to forfeit the spewing of words, when silence can heal instead. James knew to lure me from my slumber with the promise of cold brew iced coffee each morning: the Nitro variation from How You Brewin is the Guinness of iced coffee and Chameleon Cold Brew served at the Dockside Diner is my new elixir. When hunger peeled us from the sand, we cooked. My sun kissed skin still warm from the beach and my unruly curls contained with a headband, my uncle said I looked like an Italian peasant farm girl stirring the risotto. It was the best compliment I could have received. We drank wine and indulged in assorted cheeses from The Cheese Shoppe on the front porch to the tune of classic rock. After our bellies were full we would walk around the island and reminisce. We waved at strangers because who could be hostile in a beach town? One meal two ways: Seafood risotto turned arancini. On the morning of the fourth, we leapt into our Jeep with the windows down. I wanted to check emails even though I knew driving next to someone with their head planted in a screen would be a nuisance. "I wish for once you would let yourself enjoy your surroundings," he said. So I put my phone down to take it all in. We sang off key. Well he sang off key. I am always on key thanks to Nana and those years of singing lessons. He drummed the steering wheel and I peered at everyone else heading home. There are different vibes on the weekend trains. Everything feels more celebratory. Chatter of children is heard, fans are donning their team's memorabilia and out of towners are counting the number of stops before they embark on a city adventure. I can identify with them because I am still nervous on new routes I haven't frequented enough. I smell Taylor ham, egg and cheese. Let me tell you, New York City is missing out on pork roll. I asked for Taylor on my bagel at Ashby's and the cook had no idea what I was talking about, but the woman behind me let out an audible sigh that she wishes they had it too. She was a Jersey girl. I'm saying it here, Taylor Ham would change the bagel game in New York. Devices have substantially changed the way we travel, the way we live. We have a podcast plugged in our ears, a puzzle in our hands, alerts from CNN as they happen. If not for my new found affinity for writing on the train I would enact a no phone policy and just gaze out the window or at other people even. The train is a privilege not afforded to all and I want to relish the experience. I peek over at a young family with a sweet child, a mammoth camera and fruit smoothies all around. With the onslaught of the wellness movement is Juicy Juice no longer a thing? During my childhood, it came in a can. A half gallon sized can that you had to pierce with a bottle opener on both sides in order to pour. I really liked Juicy Juice, and the taste of Dimetapp too but that got recalled. Oops. We had fewer answers when I was a kid and we survived. Even fewer answers the years before that, and they survived too. I've lost the look of someone who doesn't know where they are going. I helped tourists identify that the Freedom Tower and Central Park are not next to one another. I felt something like pride when that happened. Commuting is like other hierarchies. When we are new at something, we reside in a vulnerable space. Unless we have unfaltering self confidence like Molly Brown, but even those people are vulnerable in new situations. It's human nature. Then we accumulate experience and assume the role of the senior, the veteran, the sage. If we are mindful, we retain the feeling of being the unknowing and hold on to awareness of the pain that comes with it. We treat the new person in a vulnerable position with dignity and respect. I penned a letter during a troubling time right out of college where I was quite lost in the work world. I called it "Read this when you are no longer entry level." And when someone is blubbering in the station, looking for the right platform, I'll surely help them, but only if I'm not lost myself. No guarantees. Someday I want to say that a splendid work was written in the notes app of my iPhone while waiting for a train, bereft of cell phone service. During the time I wasn't able to access the distraction of the inter web, the mindless scroll of social media and the compulsive checking of my four email accounts. As much as I crave the connectedness, I feel something like liberation when I am cut off from everything, however briefly. Then I charge up the steps into the sunlight or evening dusk to re-engage with the world, rather than lingering in the curated version accessible from my palm. Much happens when we connect with what is in plain view. We talk to the young mother sitting next to us, rather than longing to be somewhere else on a lavish adventure. We find the poetry in the mundane. When I was purposefully observing the other day, I got reacquainted with some truths: Laughter out of context is still infectious. Someone is chuckling incessantly in the row behind me and I am desperate to know what they are laughing at. Simultaneously, I don't care what the stimuli is, I feel happier anyway. People are predominately good and well-intentioned. There is a baby on the train screaming, bone curdling screams. Her mother is desperate to soothe her, all the while feeling judged by the serious commuters, when in an instant everyone in proximity to the little one find their silliest faces and as a community calm her down. I mean everyone including the suave, well-groomed man I see nearly everyday, who never smiles. Until now. The hum of the whistle makes me feel like a character in The Polar Express. I'm reminded of our family's tradition of reading the story each Christmas Eve and exchanging just one gift before laying cookies and carrots out on the fireplace. We haven't done it the past few years, but we should. Two teens giggle jovially, picking at their pimples in the reflection of their iPhones and dishing about the latest mean girl encounter at school and picture day. They seem so innocent, unencumbered by the threats all around us. Across the way an Irishman and his wife are laughing as if the hydrant to their souls had come unplugged. Bursting with glee, sipping on beers and vowing to feign ignorance if they get caught with them. The man jokes that the subway itself holds more people than his tiny town. He observes that everyone's brow is furrowed and looking angry and suggests we try and relax a little more, enjoy the journey. We being the folks sharing the Path car with him erupt into laughter. There are group photos and high fives. They are off to a football match, and to be quite honest for a moment I longed to he going where they were going, or at least to be living like they were living, freely by the moment. Then I listen to myself again. While it might be nice to be a teen again absorbed in the quandary of school picture day, or sipping a beer on the way to a football match, I have faith in this here journey, where my feet stand. I catch laughter from my neighbor and smile at children. I'm reminded to relate to others, to connect, but not to compare. How do we know with any level of certainty that their story is favorable to ours. And if it was would it matter? PS: The cake is an Olive Oil Spice cake. I use Botticelli Foods Extra Virgin Olive Oil. The applesauce in the cake was freshly made from left over pears and apples, and a little sugar. Buttermilk was made from milk and lemon juice as I didn't get to the grocery store, although I recommend actual buttermilk. The berry cherry basil mixture was residual from another baking project. It's all connected.